If you live in the US it is unlikely that you find a cellphone without Bluetooth headset. Bluetooth has become a must have option even in feature phones. Now that the demand for Bluetooth enabled phone increasing, the need for a Bluetooth headset is growing as well. Bluetooth Headsets lets you to have wireless connection with your cellphones, so that you can make and receive call or stream the music stored in your cellphone. They come in all price ranges as low as $10 to $150 and have loads of different features, depends upon the models and manufactures. Major players in the Bluetooth headset industry are Jabra, Motorola, Nokia, Plantronics, LG, Samsung and Sony Ericsson. Bluetooth Headset make your communication more convenient while you have to multi task- like you can read mails while you make calls to your clients. What more to say, many US states has made illegal to use cellphone while driving which makes it hard to take call on the go. Bluetooth headsets lets you to have ‘safer’ conversation. Bluetooth headsets works as far as you cellphone (or laptop/pc) are in the range typically 33 feet, so that you can roam around your house while keeping your cellphone in the hall. Most of the Bluetooth headsets comes with ‘multipoint pairing’ technology which lets you to pair your headsets with more than one device at a time. Since Bluetooth headsets has no or short cords there is no possibility that it is going to get tangled, which is one thing we really hate about wired headsets. There are hundreds of Bluetooth headsets from many reputed brands. On top of that they comes in varying price range and design confusing people like us which one to choose or not. Follow the below vital tips, you will definitely find the best Bluetooth headset. Bluetooth headsets comes in vast varieties. The first step is to decide under what conditions you’ll use your device. Whether you want to use your headset in your office cubicle, or in a busy street or while working out, these conditions do impact the performance of your headset. If you need only voice call facility or you need stereo music streaming out of it or may be PC integration, you should make sure that your headset supports it. Bluetooth headset comes with plenty of features. Like Voice prompt and voice command support, Caller ID, Noise cancellation, PC integration, longer battery, comfort design, multipoint pairing and even an HD quality stereo streaming these headsets can support many features. Make a note and write down the features you may need. As we all are not alike, it is very important that we get right design for our ears. Even though most of the headsets ships with customizable fit options not all headsets will match with your aesthetic sense. In general Bluetooth headsets can be classified as Mono and Stereo Bluetooth headsets. Mono (single ear piece) Bluetooth headsets may or may not support stereo streaming and always place voice call quality over audio quality. Mono Bluetooth headsets can be bulky like Plantronics voyager Legend which features a boom type design or can be compact like the Jawbone Era. 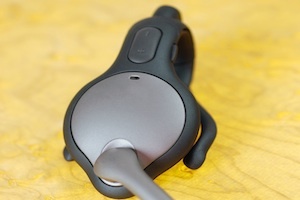 Stereo Bluetooth headsets (dual ear piece) on the other hand tends to place audio quality over call quality, and features a bulkier design compared to mono Bluetooth headset. As already mentioned, you can find Bluetooth headsets as low as $15 up to as high as $150 or more. It is you to decide how much you have to spend on the headsets. Samsung Bluetooth headsets are relatively cheaper, still give you the performance for more than the money you spend. As more money you spend you get more features in your headset. But it would be unnecessary to spend more money if you don’t use those advanced features like ‘accelerometer in Jawbone Era’. It is Plantronics M55 in the Mono Bluetooth headset and LG Tone Plus in the stereo category I have to suggest as the best budget Bluetooth headset.